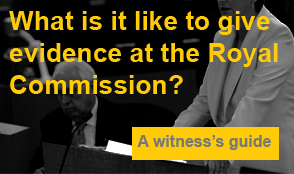 Starting on Monday the 28th April, The Royal Commission moved to Perth for a two week hearing. The public will see the spotlight shifted to the dark days of 1947 to 1968 at institutions run by the Christian Brothers in W.A. 11 men are scheduled to give evidence of the atrocities committed against the orphans which extended beyond sexual abuse into physical and psychological damage. The negligence of the Christian Brothers group has been exposed by the former residents, still traumatised by their experiences. This article from the ABC gives you an overview of day one. Scott Cunningham from Channel Nine News W.A. delivered this report into the Perth hearing, with an insight into the victim’s and the significance of their evidence.